In the Netherlands and other European countries, strict laws apply to food processing. Maintaining food safety is important primarily for consumers but also for the economy. Within the food industry, each company draws up its own plan in which the guidelines are laid down. This requires vision, policy and business resources. It also requires a sense of responsibility and proper action on the part of employees in order to safeguard the plan. Personal hygiene requires the necessary commitment from both the company and its employees. With regard to employee facilitation, various solutions are available for smaller companies up to and including large multinationals. Good policy is based on a clear vision. The vision for food safety often comes from a management team, and the conversion to policy often takes place at the top of a company. A quality manager gives shape to the policy and monitors it. However, more is needed to ensure that all workers work in accordance with the rules. Involving staff is important. Clarifying rules and making agreements together is a nice first step. Employees can only take responsibility for personal hygiene when the bigger picture is clear. Information and training contribute to consistent implementation of the policy. There is also room for critical feedback, which can be very valuable because what has been put down on paper doesn’t always work well in practice. Let employees participate in the process and make HACCP a jointly supported project. Personal hygiene goes beyond just washing your hands after lunch or a cigarette break. With the right equipment and setup, it becomes an integral part of the workflow. Elpress has more than 40 years of experience in personal hygiene applications. Together with you, we look at what is needed and how we can apply it to ensure that employees use it in the right way and at the right time. In addition, we believe it is important for such hygiene steps to ensure that delays are kept to a minimum. Breaks and changes of shift must be as smooth as possible, while ensuring personal hygiene. More information about personal hygiene? Are you curious about the possibilities in the field of personal hygiene in order to be able to comply with HACCP guidelines? 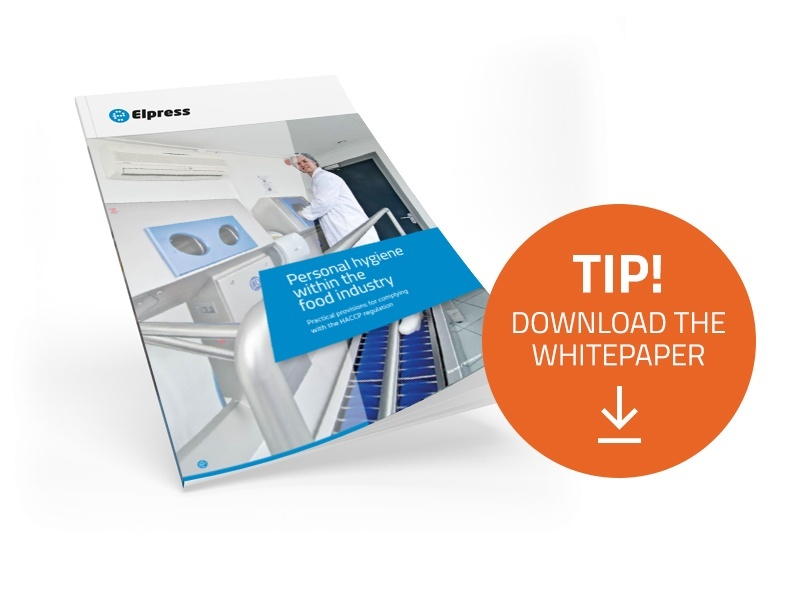 Then download our handy white paper: ‘Personal hygiene within HACCP’. Every two months you receive interesting news, useful tips and the latest product developments in the field of hygiene in the food industry. Drying hands: when is an electric hand dryer of interest for your business?